THE YOUTH THEATRE GROUP VISITED …………….. 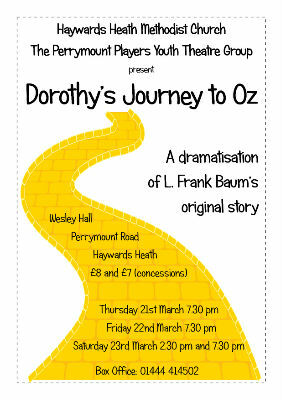 In our main production this year was Dorothy’s journey to the land of Oz ! Written as a play, we focussed on the morals behind this story ….. a story of dreams, compassion, friendship and loyalty . The group caters for young people between the ages of about 9 and 17. Most of the meetings are at the week-end on either Saturday or Sunday, although they may be during the week during holidays. Read the attached report for the church's Annual Meeting in March 2019.